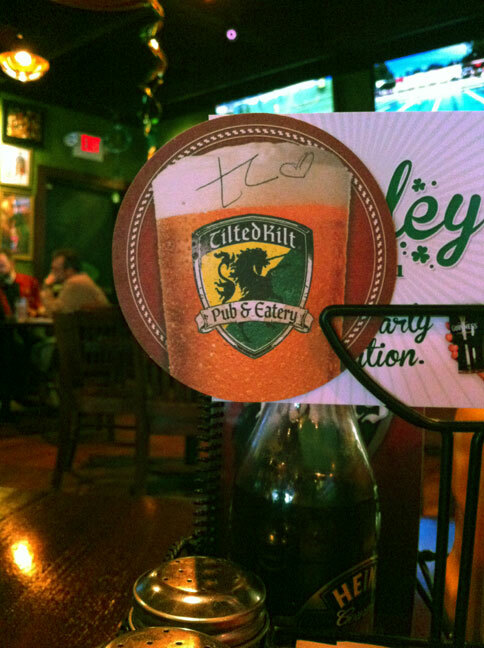 Mr. Aitch and I were driving through Morgantown, West Virginia yesterday and decided to stop for an early dinner at the Tilted Kilt. As we approached the entrance to the restaurant, a gentleman was leaving and he held the door for us. I noticed his shirt and told him that I really liked it. He nodded and thanked me. Mr. Aitch and I sat down at our table, ordered and ate our meal. When we were finished eating, the waitress came over to tell us that our meal was paid for by the gentleman whose shirt I liked. We waved to him and as we were leaving, we stopped to thank him for his generosity. He replied that it was his pleasure to help out a fellow patriot. What was on the back of his shirt? 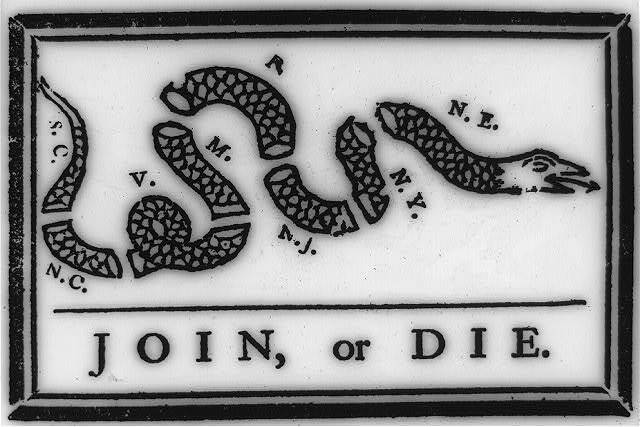 Join, or die. For more information about this woodcut by Benjamin Franklin, click here. This entry was posted in food, Random and tagged food, random thoughts, restaurants by Patti_is_knittinginflashes. Bookmark the permalink. Wow that is really neat.